PRICE: $17.50 which includes US shipping. Moving on to their next sheet, we again have six very nice options and quite an interesting variety. First up is an F-14B from, V-102 'Diamondbacks aboard the USS George Washington in 1998. It is in the simplified TPS camo scheme. A nice F-4E from the 334 TFS based at Seymour Johnson AFBin 1991. This the squadron commander's plane and from the photos I have of this aircraft is in a very clean Hill Grey II camouflage. N interesting helicopter option is this UH-72A from B Comapny, 2916 Aviation Battalion at Fort Irwin in 2012. I'm sure it was used in aggressor training based on its desert camo scheme. Another nice helicopter is this H-19A from the 4170th Strategic Win at Larson AFB in 1961. These were often used to supply missile launch complexes. This one is painted aluminum with a white top. Notice that it has the number of windows added to the cargo door so some scratch building will be needed. With the Pennsylvania ANG is this nice T-33A in ADC grey with lots of black bits. Even the front gear doors were black. Finally, a TB-25N as assigned to the 814th ABG in 1957. To properly model this one you'll want a gun nose B-25J for the solid nose. Note that this one is highly polished bare metal. You'll also have to modify the cowlings as it has ejector stubs on the bottom of the cowling and a single collector exhaust for the upper section. This was pretty normal and you'll notice this same arrangement on many B-25 warbirds as most of those were TB-25s. We are fortunate that there are a number of nice kits for all these options; some old and some quite new. 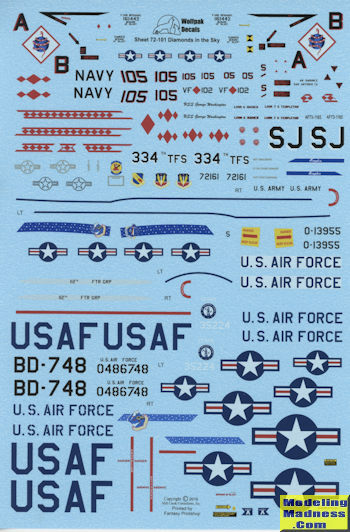 Whichever you choose, you can be sure that the decals are superbly printed by Fantasy Printshop and the sheet comes with the best background information provided by any sheet in the business. 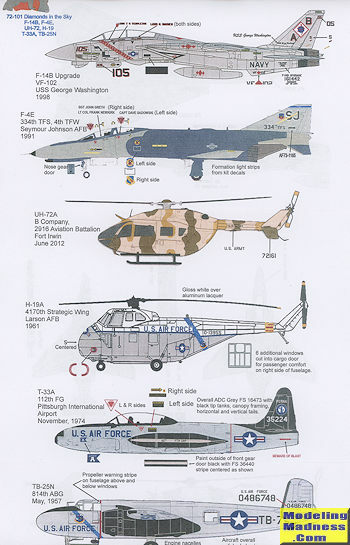 Upper camo schemes are provided for the planes that require it. Note that the Fantasy Printshop decals are quite glossy so you may want to clear coat some of these with a matte once they have been applied.